The 2018 women's U.S. Open final ended in unsettling fashion and controversy Saturday night, with both the winner and loser choking back sobs after an explosive sequence of events unlike anything witnessed in recent memory. Serena Williams was defeated in two sets by 20-year-old Japanese player Naomi Osaka, narrowly missing a chance to tie the all-time record for Grand Slam singles titles. Williams' defeat came after she was issued a questionable code violation for receiving coaching. She was then docked a point for breaking her racket, followed by a pivotal penalty in which she gave up a game because she accused the chair umpire of lying. Rarely, if ever, have we seen Serena Williams, arguably the best player to ever step on the court, reduced to tears during a match. We've seen her fiery. We've seen her enraged. But eye filled with tears, voice cracking, as she defiantly defends her position and demands the respect she has more than earned? This was new. 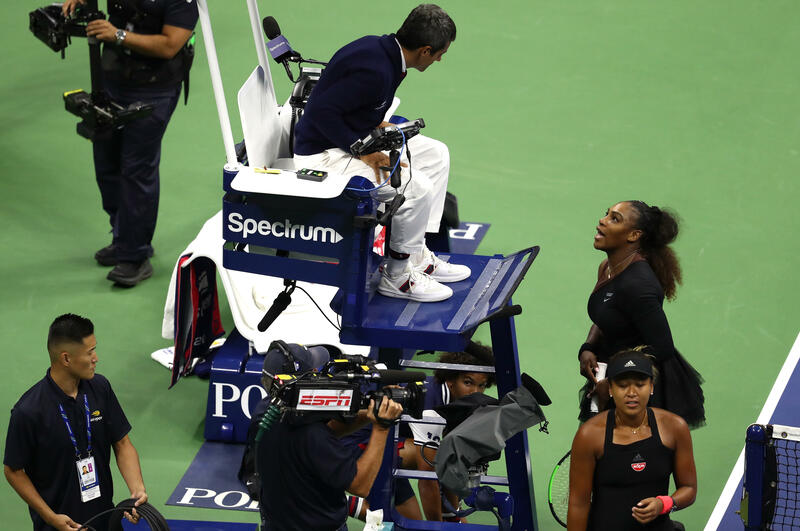 Sparring repeatedly with chair umpire Carlos Ramos, Williams refused to back down, and in doing so, highlighted the double standard in expectations and discipline that exists for men and women on the biggest stages in professional tennis. Several of her male peers took to Twitter to lament the unfortunate discrepancy. At the 2016 French Open, Australian player Nick Kyrgios blew up at Ramos after he was given a warning for raising his voice at a ballboy. "That's bulls**t. Are you kidding?" Kyrgios shouted at the official. "Bulls**t, f***ing bulls**t." He was given neither a point penalty, nor a game penalty. At the 2017 French Open, former world No. 1 Rafael Nadal threatened Ramos, "Give me the warnings you can, because you will not referee me anymore," he said. Nadal referenced his comments in a post-match press conference. No penalties were given. That same tournament, defending champion Novak Djokovic got into an impassioned argument with Ramos, approaching the chair to tell him, "You're losing your mind." The skirmish came after Djokovic was docked a first serve for taking too long in the fourth set. He glowered at Ramos, motioned with his racket while uttering something in Serbian, then approached the chair to call the official's sanity into question. While Djokovic was issued a warning for unsportsmanlike conduct, he was never officially penalized and ultimately went on to stage a five-set comeback. Perhaps Ramos considered Djokovic and Nadal's outbursts as somehow less offensive than that of Serena Williams. Perhaps there is some sort of subconscious bias at play. But these sort of double standards extend far beyond a single chair umpire. They have been rampant for decades. During a semifinals match at the 2016 Cincinnati Masters in Ohio, British tennis star Andy Murray quite literally kicked a ball at the chair umpire's head. And despite the ATP rulebook clearly stating that "players shall not violently, dangerously or with anger hit, kick or throw a tennis ball while on the grounds of the tournament site except in the reasonable pursuit of a point during a match," Murray was not disqualified. The umpire simply hit him with a pointed look and Murray went on to win the match, advancing to the final. At the 1991 U.S. Open, five-time champion Jimmy Connors got into a series of heated exchanges with chair umpire David Littlefield. Connors called Littlefield's decisions "bull crap" and repeatedly shouted that Littlefield himself was "an abortion." After each of Connors' tirades, the crowd can be heard enthusiastically cheering along with him. Littlefield can be seen raising his eyebrows, occasionally extending prolonged, disapproving glances in Connors' direction, but otherwise remaining measured and letting the outbursts slide. No penalties are given. No points taken. No games sacrificed. Connors goes on to win the match. Perhaps even more indicative of the gender disparity in this arena, is the fact that, at the start of the match, the CBS Sports commentator can be heard nonchalantly predicting, "There will be some shouting and some emotional moments in this one." For male players fired up by the heat of competition, this sort of behavior is simply shrugged off as normal. A testosterone-driven reality of the game. If you are one of the world's top athletes, you have spent your entire life preparing for the highest level of competition. You have pushed your body to its limit. Of course you will become emotional when a pivotal point is on the line. Of course you will shout and call the umpire names. Those very same qualities got you to the top in the first place. In fact, trash-talking is tolerated among male athletes in all sports. For athletes like MMA fighter Conor McGregor and NBA forward Draymond Green, it's become an integral part of their persona. But when Hope Solo called the Swedish national team "a bunch of cowards" after a heated Women's World Cup match, she was banned from U.S. soccer. Male athletes have done far worse and are still allowed to return. Numerous NFL players like Adrian Peterson, Michael Vick and Ray Lewis, have weathered controversies over child abuse, dog fighting and even a murder case, returning to multi-million dollar contracts and, in the case of Lewis, being inducted into the Hall of Fame. Unlike Solo, whose entire career and legacy were torpedoed by an instance of disciplined trash-talking, male players who achieve notoriety on the same grounds often go on to fame and fortune despite their unsportsmanlike behavior. What could serve as a better example than the fact that John McEnroe can be heard as a commentator in the Connors match above? After years of quietly frustrating women around the world, this year's Grand Slam tournaments — and the U.S. Open in particular — have thrust the issue of sexism in sports to the forefront. First, there was the controversy over Williams' medically necessitated catsuit at the French Open. Then there was the penalty issued to Alize Cornet for taking off her shirt in the scorching heat at the U.S. Open, after her male peers were permitted to sit on the court shirtless for prolonged periods of time. Now Serena Williams has been fined 17,000 dollars for Saturday night's polarizing code violations. The stakes are dramatically high for all female athletes. However, they are even higher for Williams, who is barely a year out from nearly dying during childbirth, after yet again having to go above and beyond to be given equal treatment and receive the medical attention she desperately needed. So, yes. She's emotional. She's frustrated. Williams is at, quite literally, the most important and hard-fought moment of her career, with the weight of viral ad campaigns and young players everywhere on her shoulders. The amount of criticism, disrespect and hardship she has overcome to dominate this sport would be enough to break other players, yet she has consistently proven herself in the face of it all. So when she's accused of cheating, of course she is angry. Who wouldn't be? And when that accusation creates a domino effect that culminates in penalties dealt far less frequently to her male counterparts? Of course she wants to scream at the top of her lungs. On Saturday night, Naomi Osaka may have won the trophy, but tennis lost. And now sports fans across the globe are simply hoping this is the break point.